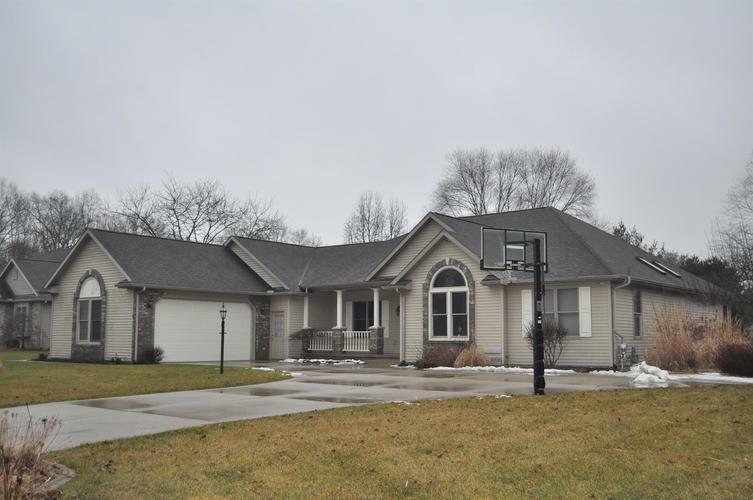 Stunning 4 bedroom 3.5 bath ranch in popular Pheasant Ridge Subdivision. This open concept home has cathedral ceilings, eat-in kitchen with newer beautiful granite counters and sitting bar area, large main level laundry, living room w/gas fireplace, nice size master suite bedroom has relaxing fireplace & roomy walk-in closet. Master bath has walk-in shower, huge tub & double sinks. Open stairway to lower level leads to great room with built-in entertainment center, game room, media room, open bar area, bedroom & full bath & also has second stairway leading to laundry room. Gorgeous landscaped yard has massive deck & patio for entertaining. Big 3 car garage has extra overhead door that opens to back yard with new fenced area. Brand new furnace 2018. Home is plumbed for hot tub & Generator. Directions:CR 6 east of CR 17 to Pheasant Ridge Subd. Listing provided courtesy of Susie Tucker Realty.